Market Leader in the Machine Vision Inspection of Ceramic tiles Surface Inspection UK Ltd falls into Administration. 22 years of Vision Technology Development for Sale. A 22 year history of Machine Vision Inspection may be in jeopardy following the appointment of RD Allen and RM Hawes of Deloitte LLP as administrators of Surface Inspection UK Ltd (Formerly Fima SI Ltd). Surface Inspection developed its first Vision controlled Ceramic Tile Inspection System in 1989. Surface Inspection's policy of continual development has earned it a market leading position within the industry and it now has an installed base exceeding 600 located in decorative tile factories world wide. The Processmaster 5G a modular design automatic inspection system installed upstream of the kiln to inspect either green or biscuit tiles. The Flawmaster 5G is an automatic inspection system that classifies ceramic tiles according to their quality, tonality and shade at the packing point. The Flawmaster 5GX is a large format version of the 5G taking tiles up to 1200mm x 1200mm. Until late 2008 assembly of the equipment was based in the UK. 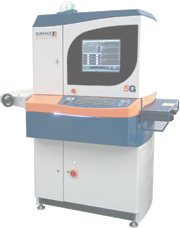 In an effort to reduce costs production had been licensed to an Italian assembly partner enabling Surface Inspection UK to move to smaller premises and focus on the research and development of both the systems in operation and potential new applications. Assembly whilst skilled can be re-located. In 2007 sales were £5.4m and in 2008 they were £4.8m with the last few months being royalty income only following the manufacturing agreement. Michael Charles of Amco has been retained to seek out a buyer for the Company and / or its assets including its extensive Intellectual Property Rights. Michael Charles said "We have been very impressed by the depth of knowledge and technical ability in this company. It is unfortunate that the market has turned against Surface Inspection as otherwise they would have been exploiting other market sectors"
"We are looking for a decisive buyer who recognises the inherent value in the Intellectual Property Rights contained within the company". "The talent within this company should not be allowed to dissipate". The company's website http://www.surface-inspection.com has more detail about the company and its products.